TiSPY takes a regular back-up of the App log information from the target device. 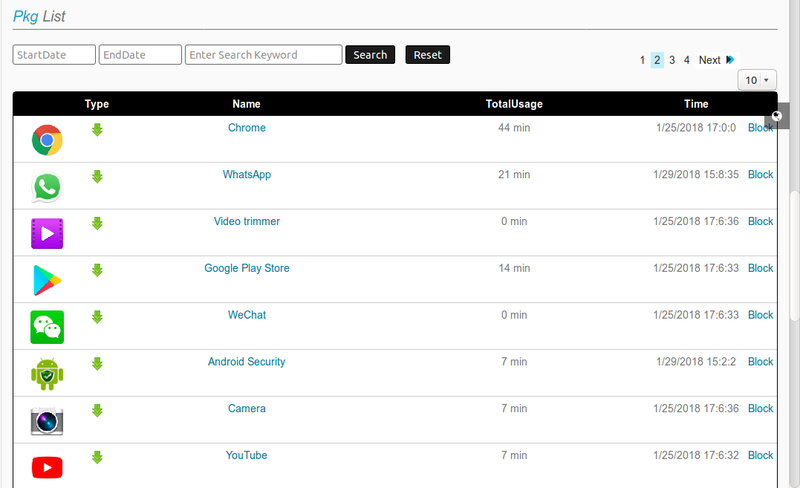 and It instantly uploads the data to your TiSPY account, for you to monitor. As a parent, you will be able to monitor what Apps your kid is using. This will help you keep them safe from harmful apps. TiSPY gives you a complete control that whatever application your child installed in his/her device. You can able to see how many times and which application your child refered.Also No need to root your target android device to use this feature.You can also block or unblock application remotely in target CellPhone which you don't want to access your child. Access installed application directly from your TiSPY dashboard. For that system requires one time installation in android CellPhone which you want to monitor. After then login into your TiSPY web account and Go to "Packages Installed" page here you can monitor all applicaton which are installed in target device. You can also monitor Date and time of application which date and time application installed in the Cell Phone. Yes You can see entire application that installed on your target Cellphone which you have installed TiSPY application. No, It will not require root your target device. It will also work with non rooted device. For that you need to enable accessibility to the target device. (1) Open your TiSPY Dashboard ==> Go to "Locate Device"
(2) In that you can find "Allow app usage" click on that. (3) That will pop-up one menu in your target device click allow application permission. After it will start to update application time and usage in your TiSPY web account.